Are you looking for the right VPS plan? You might get stuck in a sea of offers that all seem “pretty good,” but what determines a good VPS from a bad VPS host? With any business, you should know exactly the value of what you are purchasing so that you get the best rate, and you never exacerbate your resources. That can be difficult when trying to build a new website and not knowing where to start. Virtual private servers (VPS) are not that expensive nowadays. You can find a relatively good VPS host for pretty cheap. 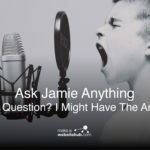 The world is awakening to how these servers work and finding out that they can build their own servers or create their own hosting options with a little know-how. That is why your VPS in today’s world should provide a lot of features and storage for a relatively low price. The market is flooded with all types of VPS plans, so there is no reason you should pay over $20/month for a VPS plan. We think that you should pay even less for cheap VPS hosting. However, you also want to get a host that has customer support, good uptime, and security features. These are important to keeping your website stable and free of issues. 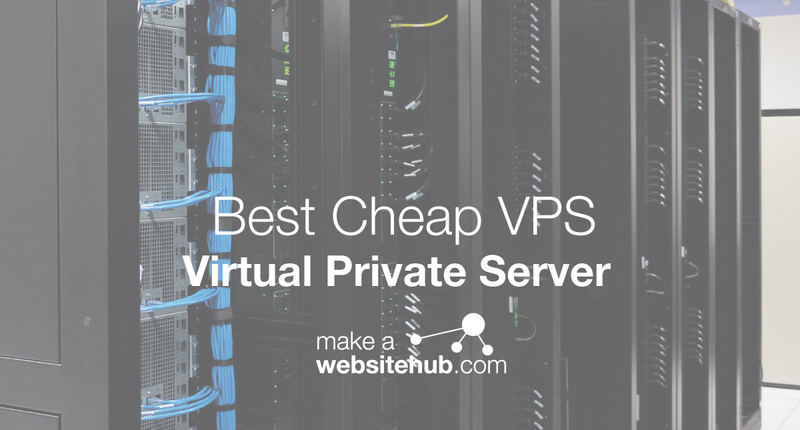 While some VPS hosts will promise the world for less than $5, you should make sure that you are getting a good value for the product. VPS hosting is unlike other hosting in that it is more space than shared hosting but not a whole dedicated server pricing. 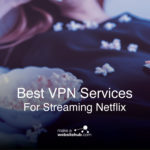 You typically get a space on a large server that has its own port and bandwidth that you do not have to share with anyone else. You can visit a few different websites for unbiased reviews, but the best way to tell how customers like a company is to go on Facebook and see comments on their posts. You can tell how much a customer has been scorned by the way reviews and comments are written on promotional posts. 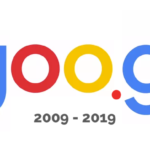 There are also customer reviews on Google and PCMag.com. Every VPS hosting provider should provide a SLA so that you know you are going to get a good value for the cost. Some may do this in the form of a money-back guarantee if the uptime is not as promised, or if your website fails during the first 30 to 90 days. Uptime monitoring tools can be installed on your website as well. When you purchase a VPS, you are typically also getting managed support services. This means that your technical support should be on 24/7 for any questions or issues that may rise up while you are operating your website. Most websites today should be running 8GB of RAM or more with at least 200GB of storage for a small website and at least 2TB of SSD storage for a larger site. There are differences in equipment and quality, so always check that you are getting a good processor (dual-core or Intel Xeon) and that you have a lot of security options to go with it. This is a big factor in determining the cheapest VPS hosts online. Right now there are plans as low as $2/month in some cases. The cost should balance out with the value and what you are getting however. You also want to make sure that you can scale up your servers so that you can build as you grow. Here is a look at the Best Cheapest VPS hosting providers and what makes them good or bad as a choice for your next project. From Tulsa, Oklahoma, Hostwinds has always promised to be fast and reliable. The hosting provider has been open for 11 years and has made some significant strides in the past few years to improve their offerings and price to match the competitive market of VPS hosts today. Hostwinds gets a high rating from customers on reliability, but does the price match the value? Most customers say yes! In fact, Hostwinds gets a lot of praise for its uptime and VPS plan options. As far as their packages go, you will get a single core processor, 512 MB Ram, and 20 GB of disk space with the tier one package. This is actually about the same as 1and1.com but with a higher customer satisfaction rating. Very large websites or databases should not look to Hostwinds for a lot support. These are for small server spaces.. The largest package plan offers just 2 CPU cores, 4 GB or RAM, and 50 GB of disk space. However, if you decide to go bigger, you can choose to add on for a whopping $551.99/month for a 9TB/1 GB port in bandwidth. Hostwinds provides a 99.99% SLA guarantee as well as a money-back guarantee. These are just a few of the perks that bring Hostwinds up a notch. There are also multiple data centers to choose from and full VPS management options so you do not have to worry about security updates, malware scanning, or performance issues. Your site should be up and running within 60 minutes as well. Hostwinds has a great package to offer those who want to build smaller websites for a cheap price. For a much larger VPS, you are also looking at a pretty good deal per month with their add-ons and security features. VPS hosting for $4.99/month is pretty cheap. This VPS host has several different plans, with their base package starting from 512 MB and 30 GB SSD storage. These servers come with an Intel Xeon processors, which are the highest quality available in the industry. In addition, your storage is on a fast SSD rather than an old HDD. You can purchase packages with more bandwidth, storage, and traffic just by looking at plans their different Cloud plans. There is an additional cost for these plans, but you get unlimited traffic. You will never have to worry about sending too many visitors to your website or streaming too much with these servers. 1and1.com also provides full root access so you can configure the server how you like. Your VPS will also come with 1 to 4 core machines, VMWare optimization, 24/7 customer service, Linux or Windows operating systems. You also get a KVM console so that you can access the server wherever you are and install performance tools to make sure that it is up and running correctly. One of the other nifty things about this host is that you get to choose your datacenter.. 1and1.com also has 99.99% uptime rating and a guaranteed SLA. You can get your money-back if you run into issues with your website failing or experiencing slowdowns. The best way to check this is through a performance monitoring tool. 1and1.com does a great job of making its hosting services affordable and valuable for the customer. You can also find a number of discounts for 1and1.com if you want to get a much cheaper rate but you may possibly have to pay upfront to get the monthly rate you want. The pricing at 1and1.com is hard to beat for what you are getting at the base price. With tons of options and a lot of features thrown in, 1and1.com is making sure that they remain the most customer-friendly of hosting providers. Building a site on a budget has its tradeoffs. If you choose OVH, you might have to deal with some issues like poor reliability and not-so-great customer support. There have been several complaints against OVH for its uptime reliability in the past few months. However with OVH,, you are not paying as much for customer support as you are for the exact space and size of your server. The basic plan offers 1 single core processor, 2 GB RAM, 10 GB SSD, and local RAID 10. If purchased annually, you can get the rate to as low as $3.35/month. OVH promises 99.95% uptime, but this promise does not always seem to be verified by customers who have canceled service in the past because OVH went down. There are multiple plans available so you can scale resources. There is a control panel that lets you make changes and add-on to your site, which makes it very self-reliant. OVH offers unlimited traffic with each plan and anti-DDoS protection. However, customers have pointed out that OVH does not provide a ton of customer support options on the website. When customer support is available, there have been instances of poor English language or just downright bad customer service, which has led to some poor reviews of OVH overall. Most customers say that the first 30 days is okay, but you may experience some downtime and lots of server errors. You should read some customer reviews before starting to use a service like OVH. We could not believe the rates for this host’s VPS packages. Even with such a low rate, Virpus offers a lot of value for a very small price. To get these prices, you do have to pay upfront annually. However, that is just $25/year for VPS hosting for the base package. This includes a Linux-based server using SSD-caching and a full VPS management panel included. The basic package has a dual-core processor with 512 MB of RAM, 25 GB, and 1.5 TB of bandwidth. Customers can choose to scale up to 48GB of RAM and 1,500 GB of storage with 9 TB of bandwidth for $180/month. Each VPS plan includes XEN virtualization, RDNS/PTR management, and 1 IPv4 address. In addition, 24/7 customer support is available for Virpus customers, however you may be speaking to them through a ticketing system rather than on the phone. Virpus has a slightly poor uptime at 99.94%, and customer reviews have not been favorable on reliability. However, some of these reviews are dated a year ago. One thing very noticeable is the lack of customer support and technical support on the phone or by live chat. Most hosting providers have extensive customer support, but Virpus is a smaller hosting provider and may not be able to accommodate all customer requests. The site features a sales number, but that will not help if your server is crashing. If you are looking for a very cheap server and do not mind the occasional downtime, then this could be a good option to try out and play around with a server for building purposes. If you are looking to purchase for a business, you might want something that is a little bit more reliable. Excellent support and tons of options come with the VPS hosting plans at VPSDime. At the basic level, you will get a solid VPS for a decent price at $7/month. However, you should not expect some of the features that are available on other hosts for this price. Their lowest package includes 6GB of RAM, 30GB SSD space, 2TB traffic, and 100 Gbps uplink. The value here is the amount of RAM, but the 2TB of traffic is not as good as unlimited, which is available through some of the other cheap VPS hosts. In addition, VPSDime’s base package is only for Linux servers. These servers come with full root access, inclusive control panel, full SSD storage, and a fast network guarantee. There are data centers all over the globe with VPSDime, so it doesn’t matter where you live, you can pick a server that meets your specifications and location. You can also read a lot of testimonials about VPSDime on their website. Other reviews reveal that they have excellent customer service, lots of scalability, . You can read all of their testimonials and social tweets on their VPS hosting page, which lets you know that they have a dedicated customer support team. They promise a 99.99% uptime and also have Idera backup and restore. This means that even if you think you have lost your site, you will have an automatic backup ready and waiting to restore. VPSDime has excellent value for the cost at 5GB of RAM for just $7/month. They have also received rave reviews for their 24/7 support and pricing. Interserver is very scalable and starts out with a single core processor, 1024MB processor and 25GB of storage space for $6/month on a Linux-based system. Unlike other hosting providers, you can also get base plans with Windows for a very cheap price, starting at $10/month. This VPS hosting provider claims that it makes cloud VPS hosting much easier than other hosts. You get an easy-to-use control panel, and you can install hundreds of apps right to your cloud VPS from your control panel. It also comes with a free migration service. One of the best parts about this host is that you get a 99.99% uptime guarantee. You will not have to worry about downtime and can even get your money back if you experience problems with your server. With instant provisioning, backups and snapshots, and multiple language servers, you can do a lot with Interserver and pay next to nothing for the service. One issue that we found is that the support did not answer all of our questions about the VPS or was not able to understand some of our questions about uptime and types of processors available with their VPS systems. However, they do have 24/7 customer support. When you want to get a cheap VPS, your mind may go straight to GoDaddy. After all, they promise to be the cheapest. However, they are not so cheap with their VPS hosting plans. However, you can pick and choose, scaling as you like, as there are a dozen different plans to choose from. GoDaddy wants you to customize your VPS and provides different plans to cover small to medium businesses, gaming, and large enterprise websites and applications. If you are a small business looking to start small, then you can go with the economy package starting at $17.99. This basic plan provides 1GB memory, 40GB storage, unmetered bandwidth, 3 dedicated IPs, and a free 1-year SSL certificate. Your VPS hosting plan can scale all the way up to the final “ultimate” package for $39.99. This package packs a great deal for those who want to build a larger website as it includes 8GB of memory, 240GB of storage, and unmetered bandwidth. Each VPS plan comes with 3 dedicated IPs and a free 1-year SSL certificate. You will not have uptime issues, and if you do, GoDaddy also provides a guarantee so you can get your money back. Uptime for GoDaddy averages at about 99.99%, and the website provides 24/7 phone support with mostly in-house techs. Your VPS is a mega Internet machine. All VPS hosting plans come with dual-core Intel E5 processor with double 600GB HDD. Windows or Linux servers are available. 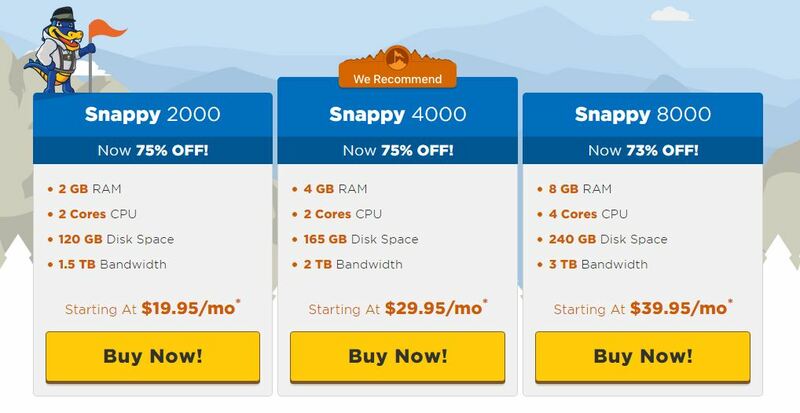 GoDaddy will let you scale as much as you want, and you typically will not pay as much as you would with some competitors for their larger hosting plans. Here is a look at the Best Cheapish Mid-Range VPS hosting providers. Even though it breaks our $10 threshold, HostGator has a lot to offer with its base plan that makes it very valuable for a small business. HostGator also has one of the highest reliability ratings for a VPS host. HostGator offers numerous plans and scalability options that give you a lot of control in a VPS environment. If you want to go with their most basic packages, Their most basic package offers 2GB of RAM, 2 Cores CPU, 120GB of disk space, and 1.5TB bandwidth. While that is not a lot of RAM, the dual-core and disk space on SSD is worth the cost. Plus you can always find sales and discounts for HostGator. HostGator VPS is all about how you customize your machine and set up your own applications. HostGator gives you total control over your environment but also still helps you manage with security features and upgrades that can be automatically installed so your server is always stable. HostGator can also provide custom installation and configuration options. All of their plans allow you to pick your VPS. You should know that their data center is state-of-the-art and comes with redundant HVAC units. Everything is available to you with root access on HostGator, so your VPS can be set up the way that you like. Customers can create custom scripts and applications as desired. You can host an unlimited amount of domains, sub-domains, email services, databases, FTP accounts, and private nameservers. This is beneficial if you plan on partitioning out your services to clients and paying for your server by selling off hosting. There are various site development tools, free website templates, and different script installations to quickly get up and running. If you already know what you want to do for your website, this makes it easy to build a store or setup a website with a template and start selling online. There is a money-back guarantee and promise of 99.99% uptime with all websites. 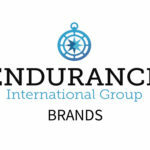 Their customer support offers 24 hours a day, 7 days a week phone system. HostGator also provides a knowledgebase for common answers to website hosting questions. HostGator provides a lot of value for the price, even if it is on the higher side of the hosting providers that we have reviewed. This is because you get a lot of features that are not included with other hosting plans. You also have access to 24/7 customer support and hundreds of site templates to make building your sites a breeze. VPS Hosting Plans: Bluehost VPS plans start from $19.99 per month ( Normally $29.99 p/m – Use this link for discount ). When you want to get a cheap VPS, your mind may go straight to Bluehost. After all, their shared and dedicated hosting prices are know for being some of the cheapest on the market. However, they are not so cheap with their VPS hosting plans, but believe me they are high quality and come with decent features. Bluehost wants you to customize your VPS and provides different plans to cover small to medium businesses, gaming, and large enterprise websites and applications. If you are a small business looking to start small, then you can go with the standard package, starting at $19.99 per month. This basic plan provides 2GB memory, 30GB SSD storage, unmetered bandwidth, 1 dedicated IP, a free 1-year SSL certificate, 2 cores and 24/7 managed servers. 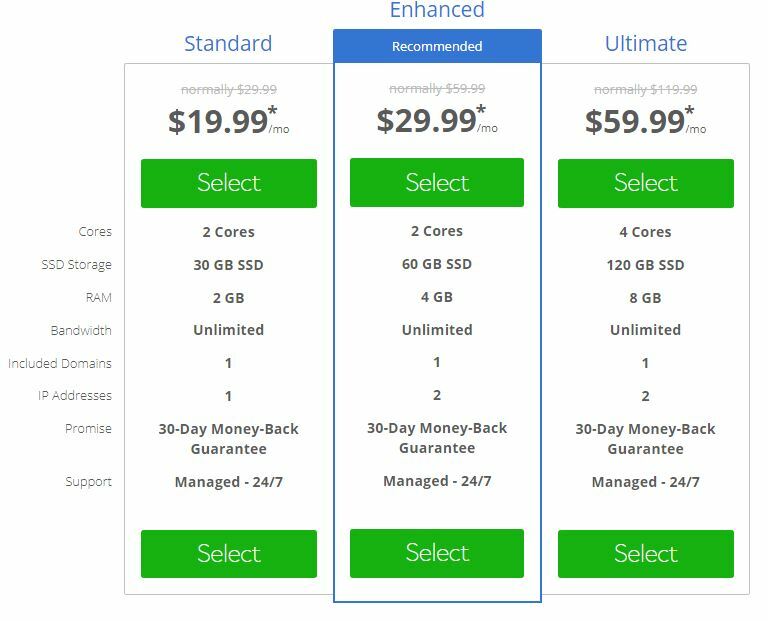 Your VPS hosting plan can scale all the way up to the final “ultimate” package for $59.99 ( Normally $119.99 p/m – Use this link for discount) This package packs a great deal for those who want to build a larger website as it includes 8GB of memory, 120GB of storage, and unmetered bandwidth. This VPS plan comes with 2 dedicated IPs and a free 1-year SSL certificate as well as 4 cores and 24/7 managed servers. Bluehost will let you scale as much as you want, and you typically will not pay as much as you would with some competitors for their larger hosting plans.